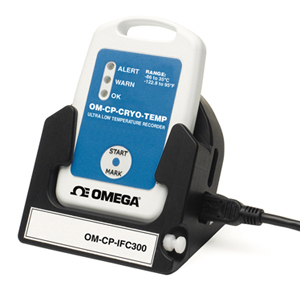 The OM-CP-CRYO-TEMP ultra low temperature data logger records temperatures as low as -86°C (-122ºF). The OM-CP-CRYO-TEMP can be used in a broad line of applications such as monitoring blood plasma, vaccines, pharmaceutical, frozen foods and shipping containers.This stand-alone device does not require any additional probes. The enclosure is designed with a handle for easy attachment and is IP65 splash resistant. It utilizes a USB docking station (sold separately), to communicate with a personal computer or laptop. The OM-CP-CRYO-TEMP provides date and time stamped temperature readings. Our easy-to-use Windows software does the rest. The user can view the data in graphical or tabular form. High and low alarm limits and high and low warning limits can be programmed through the software. The user can set the alarm limits in the range required for the goods to be maintained. The warning limits can be set to alert the user when the temperature is nearing a high or low alarm limit, so that proper action can be taken to ensure the integrity of the goods. The OM-CP-CRYO-TEMP is equipped with three LED’s. The green LED will blink every 15 seconds while the recorder is logging data. The yellow LED will blink every 3 seconds when the temperature has breached the warning limits. The red LED will blink every 3 seconds when the temperature alarm limits have been exceeded. The OM-CP-CRYO-TEMP is the ideal temperature monitoring solution for any application involving ultra low temperature recording. Nota: Logger comes complete with 3.6V lithium battery. Operator’s manual and interface cable are included with the OM-CP-IFC200 software/cable package (required for data logger operation, sold separately). This product page contains items that either have a Lithium Battery installed in the equipment or have a Lithium Battery packed with the equipment. These items are regulated for air transportation. For International shipments a surcharge and/or additional time may be required and will be advised at order acknowledgement.